We should clarify terminology. A "nuc" is a term that is short for a nucleus colony or a nucleus hive. A nucleus colony is a colony that has a little of each of the resources of a colony i.e. open brood, capped brood, honey, pollen, queen, workers etc. A nucleus hive is a box that is smaller than a normal hive, i.e. something less than eight frames, usually and more than one frame. So a typical nuc box is probably the five frame box. 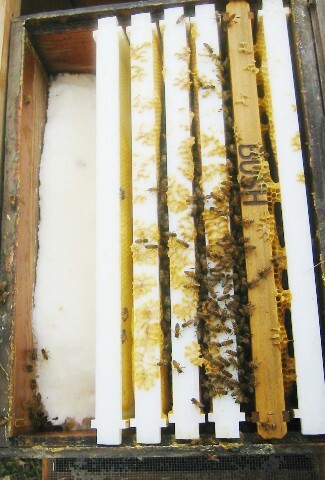 A typical mating nuc box might be two or three frames. Whether the term "nuc" means the colony (the bees) or the box (the hive) is usually determined by the context it is used in. 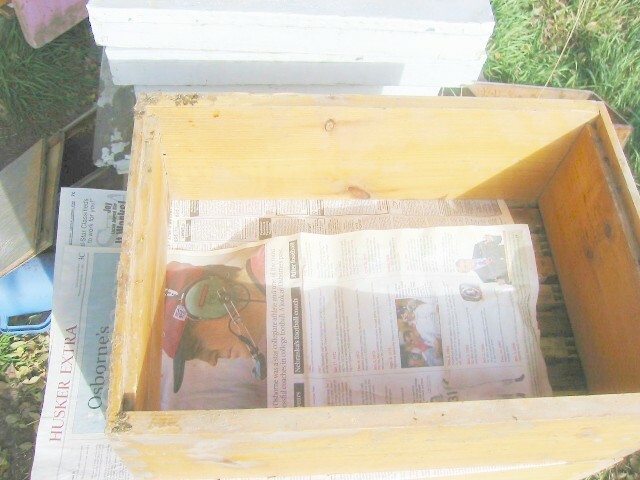 When people are buying "nucs" in the spring to rebuild their population of hives they usually mean five frames of bees, often put in their own ten frame box when they pick it up. This page is discussing both the size of the box and it's uses as well as overwintering nucleus colonies in nucleus boxes. I'm a big believer in giving bees just the room they need, up until the main honey flow. 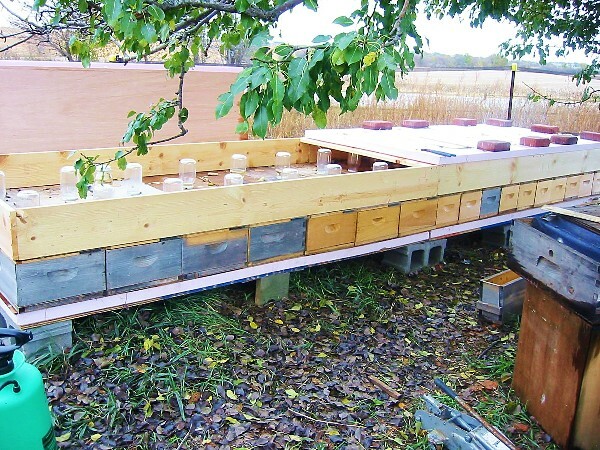 Nuc boxes allow you to limit the space that a small number of bees and brood has to take care of while they get established or while they overwinter. Here are some pictures of my nucs and my overwinter setup. On the left is Two By Four mating nucs. Four nucs with two frames each in one ten frame sized box. Note the blue cloth sticking out. There are canvas inner covers so I can open one nuc at a time without them boiling over into the next nuc. Also note the Ready Date Nuc Calendars on the end. On the right is assorted medium depth nucs. Number of frames from left to right 2, 3, 4, 5, 8, 10. I like the two frame nucs for mating nucs. The 8 frame medium boxes make a nice nuc as they are the same volume as a 5 frame deep. 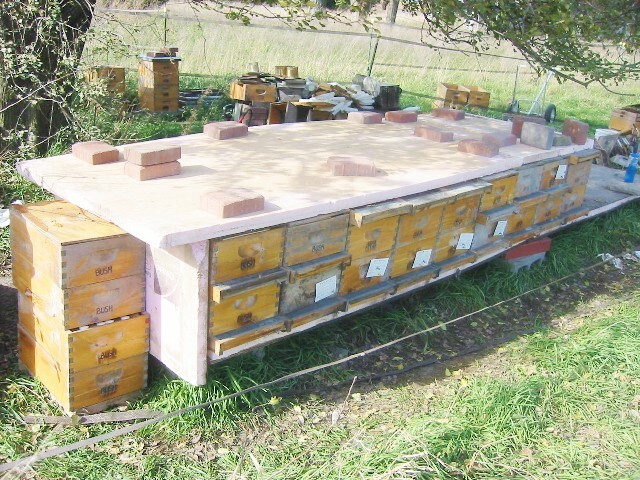 This was my plan for trying to overwinter nucs the last couple of winters. There are 14 eight frame and 20 five frame nucs. The base is four by eight sheets of 3/4" plywood with a sheet of Styrofoam and a sheet of 1/4" luan on top of that. The nucs are in rows on that. The bottom is made of 1/4" luan with a vent in the back. The top is also luan with a hole for a quart jar feeder (with #8 mesh under it) and another vent in the top. The entrance is about an inch wide by 3/8 inches high on the five frame nucs and about 2 1/2 inches wide on the eight frame nucs. I had to reduce them all down with #8 hardware cloth to cut down on robbing so all of them are now about 3/8 by 3/8 inches. Two got robbed out and died already but the rest seem to be doing well. One has a queen bank in it and has a terrarium heater under that one. The top is big box made of one by eight and a sheet of Styrofoam (for each section) on top of that to close it off. There's a thermostatic electric space heater inside set to 70° F (20° C). The biggest problem I had was the feeders leaking and keeping the bees in the queen bank from clustering and leaving out the queens. A terrarium heater underneath helped with the queen bank. The first two pictures are feeding dry sugar, which is what I did for the nucs this year. 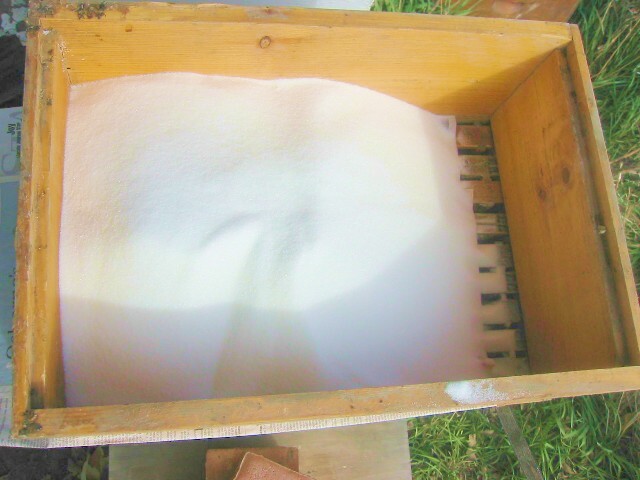 The next picture is a frame feeder full of dry sugar. The next is feeding on the side without the frame feeder, just removing a couple of frames. The last two are the setup for wintering this year. There is a gap down the center with a small thermostatic space heater set at 60° F (16° C). Styrofoam covers three sides of the cluster of nucs. The doubles have an extra bottom on top to fill the space and the singles on top of each other each have their own bottom board. The bottoms are feeders so syrup could be put on the bottom in the spring or warm weather for feeding. I recommend having at least a couple of nucs for a beginner. They are so useful for starting hives and rearing queens and keeping a spare queen. 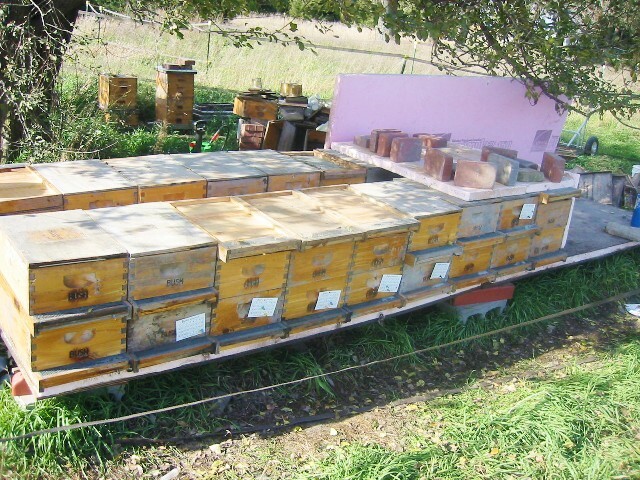 Since I've recommended mediums for everything, I'll point out that you can buy five frame medium nucs from Brushy Mt Bee Farm. You can also buy 8 frame boxes which are a nice intermediate nuc size that is the same size as a 5 frame deep nuc box. I think Miller Bee Supply has medium nucs as do Rossmans and possibly some others. A deep nuc could be cut down also. You can make your own if you're handy with wood. I find an attached bottom board and a migratory cover are adequate for a nuc. I have made them in two frame (mostly for setting aside a queen or for mating nucs) three frame, four frames and five frames. Since I'm running mediums, I suppose an eight frame box is the equivalent to a five frame deep nuc. I also use the eight frame boxes for nucs. I tend to use them to give a minimum size to a colony starting out. Any excess space is more work for a small colony. Splits You can put a frame of brood with eggs a frame of emerging brood a couple of frames of honey and pollen and put them in a nuc and shake another couple of frame of bees from some brood in and the bees will raise a queen and you will have a new hive. When they fill the nuc, move them to a standard box. Artificial swarm. If the bees are trying to swarm, do as above except add the old queen to the nuc and take out all but one or two of the swarm cells in the hive. Making queens from swarm cells. As above you can do a split to get them to make a queen, but also when they are trying to swarm you can as in the first (splits) and put a queen cell in each nuc with the brood and honey and bees and they will hatch the queen and you can use them for requeening or selling or whatever you like. Of course you can also do queen rearing to get the cells to put in. If you have multiple queen cells you can cut some off and put them in nucs. Keeping a backup queen. When you requeen take some of those old queens and put them in nucs with a frame of brood and honey and if the new queen gets rejected you still have a spare. Also, if you just keep a nuc with a queen in it for a spare, you can requeen a hive with that queen. To keep it weak, keep taking sealed brood out and giving to other hives. Foolproof requeening. If you do as in the first (splits) and put a caged queen in the nurse bees will quickly accept the queen. After she is laying you can kill the queen in the hive to be requeened and do a newspaper combine. Bees readily accept a laying queen. Queen bank. I built a shim that is the size of a nuc but ¾" thick and put queen cages with the wire down to keep them for several days or weeks before introducing them. Comb building. This is especially nice with regressed bees. Since the problem with 4.9mm foundation isn't getting the bees to use the cells, it's getting unnatural large bees to BUILD the cells. 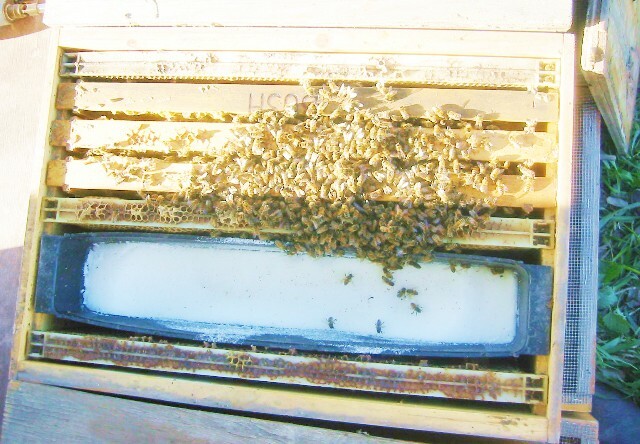 If you start a nuc with small bees as in the first (splits) and after it's established, put frames with 4.9mm foundation in the 1,2,4 and 5 position. Feed it well and remove some drawn frames everyday. If there are eggs, put it in another colony to let them emerge and then steal the frame. Keep 3 or 4 pounds (1 or 2kg) of bees in the nuc. Swarm catching. Nucs are nice for hiving small swarms. Bait Hives. 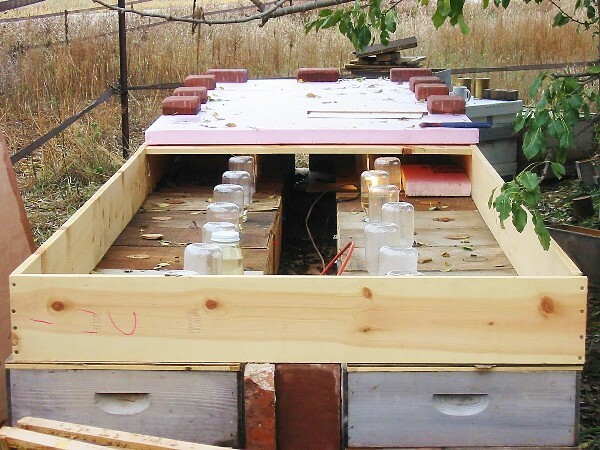 Nucs are nice for bait hives for swarms. You could use a 10 frame box and that is a nice size too, but is harder to attach in a tree and for best results they need to be 10 feet or so up a tree. Shaken swarms. You can put a screen bottom on the nuc and shake bees from brood frames from several hives (being careful NOT to get a queen) and you have a bunch of homeless queenless bees. 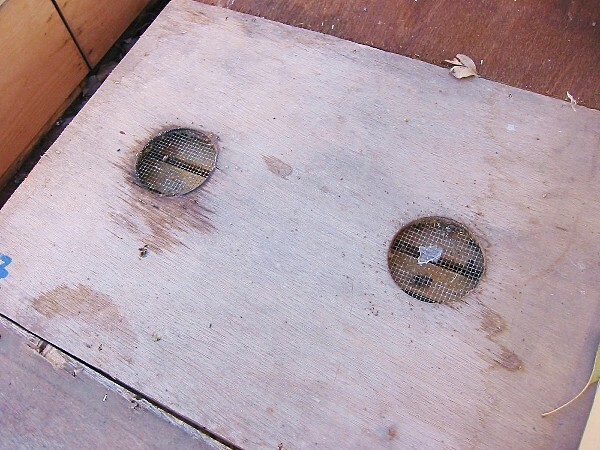 These can be put in hive with some brood so they can raise one or added to a nuc with a caged queen. Transporting honey. Nucs are nice and light even with five frames of honey, compared to a ten frame box. Nice for putting frames in as you brush off the bees to harvest and nice to carry around.